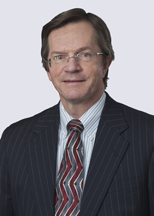 Tom Wootton counsels clients in the areas of chemical, biological, and pharmaceutical patents, ideas, and inventions. US 7,232,680 B2, Jun. 19, 2007. Infectious CDNA clone of North American porcine reproductive and respiratory syndrome (PRRS) virus and uses thereof. Calvert et al. US 7,132,106 B2, Nov. 7, 2006. Infectious CDNA clone of North American porcine reproductive and respiratory syndrome (PRRS) virus and uses thereof. Calvert et al. US 7,041,473 B1, May 9, 2006. Alzheimer’s disease secretase, APP substrates therefor, and uses thereof. Gurney et al. US 6,913,918 B2, Jul. 5, 2005. Alzheimer’s disease secretase, APP substrates therefor, and uses therefor. Gurney et al. US 6,869,965 B2, Mar. 22, 2005. Antimicrobial quinolone derivatives and use of the same to treat bacterial infections. Gordeev et al. US 6,867,018 B1, Mar. 15, 2005. Alzheimer’s disease secretase, APP substrates therefor, and uses thereof. Gurney et al. US 6,846,640 B2, Jan. 25, 2005. Time-resolved fluorescence assay for the detection ofmultimeric forms of A-Beta 1-40. Peach et al. US 6,844,148 B1, Jan. 18, 2005. Alzheimer’s disease secretase, APP substrates therefor, and uses therefor. Gurney et al. US 6,841,557 B2, Jan. 11, 2005. Compounds for the treatment of addictive disorders. Anderson et al. US 6,835,565 B1, Dec. 28, 2004. Alzheimer’s disease secretase. Gurney et al. US 6,828,117 B2, Dec. 7, 2004. Alzheimer’s disease secretase, APP substrates therefor, and uses therefor. Gurney et al. US 6,825,023 B1, Nov. 30, 2004. Alzheimer’s disease secretase, APP substrates therefor, and uses therefor. Gurney et al. US 6,797,487 B2, Sep. 28, 2004. Polynucleotides encoding Alzheimer’s disease secretase. Gurney et al. US 6,790,610 B2, Sep. 14, 2004. Alzheimer’s disease, secretase, APP substrates therefor, and uses therefor. Gurney et al. US 6,689,769 B2, Feb. 10, 2004. Antimicrobial quinolone derivatives and use of the same to treat bacterial infections. Gordeev et al. US 6,458,820 B1, Oct. 1, 2002. Method for preventing or the progression of neuronal damage with pramipexole as a neuroprotective agent. Hall et al. US 6,440,694 B1, Aug. 27, 2002. TNF-related death ligand. Bienkowski et al. US 6,410,597 B2, Jun. 25, 2002. Use of pramipexole for the treatment of addictive disorders. Marshall et al. US 6,391,876 B1, May 21, 2002. Reboxetine for treatment obsessive compulsive disorders and panic disorder. Dubini et al.